"The staff were wonderful, chatting me up and suggesting 2 gr..."
Have a question for Zen Diamond Suites ? "The breakfast had great options from continental to Asian food and the staffs were super friendly." "Will definitely recommend to my friends." "Love this 2 rooms spacious hotel apartment with modern and convenient location." "Room is spacious and comfort." 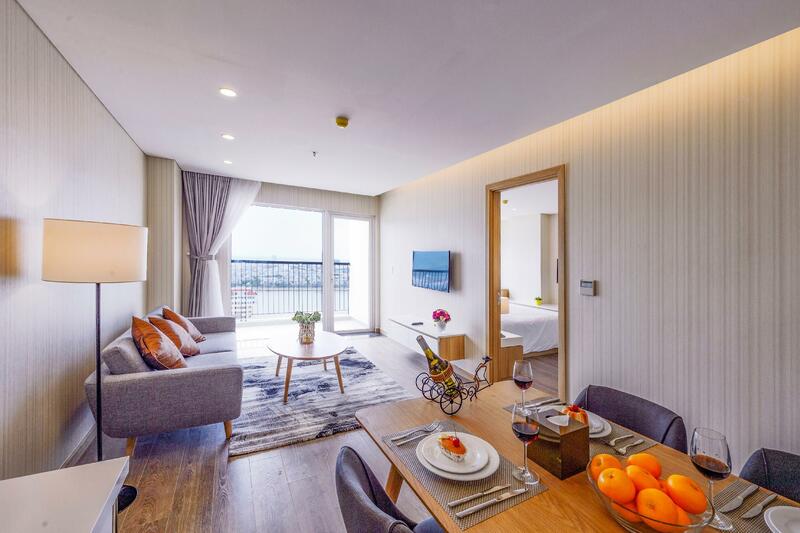 Nestled in the heart of Hai Chau, Zen Diamond Suites is an ideal spot from which to discover Da Nang. Only 4.7 km away, this 4-star property can be easily accessed from the airport. With its convenient location, the property offers easy access to the city's must-see destinations. At Zen Diamond Suites , the excellent service and superior facilities make for an unforgettable stay. Top features of the property include free Wi-Fi in all rooms, 24-hour security, convenience store, daily housekeeping, taxi service. Step into one of 285 inviting rooms and escape the stresses of the day, A selection of amenities can be found in most rooms, inlcuding flat screen television, bathroom phone, complimentary instant coffee, complimentary tea, free welcome drink. The property offers many unique recreational opportunities such as fitness center, sauna, indoor pool, massage, kids club. 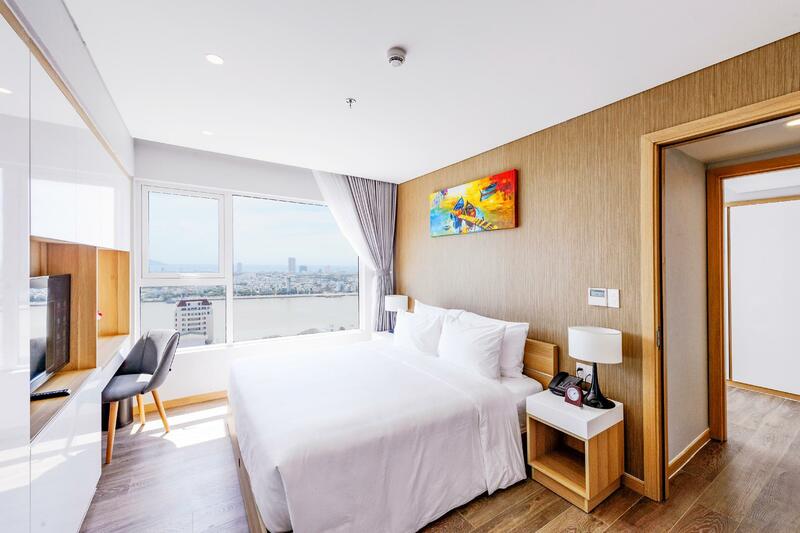 Zen Diamond Suites is your one-stop destination for quality accommodation in Da Nang. "Very spacious and feel like home." 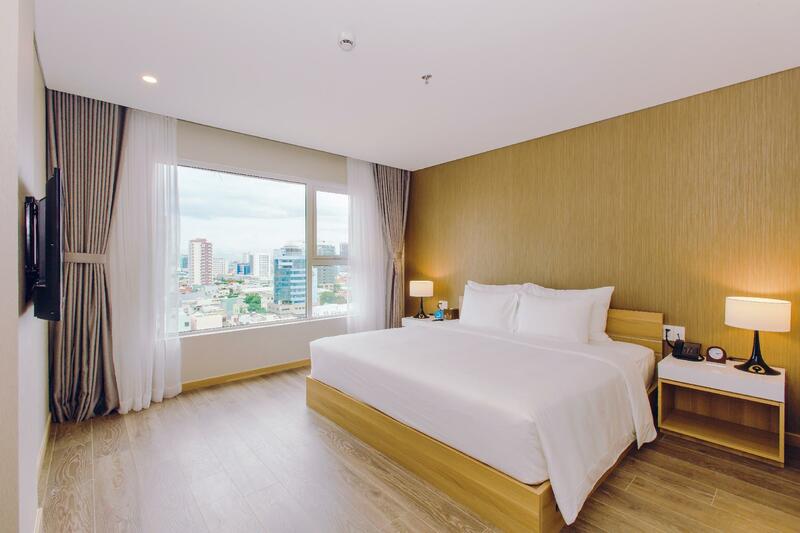 Children 6-12 years old will be charged VND 125,000 when using existing bedding. Children over 12 years old are considered as adults and will be charged the full breakfast rate of VND 250,000 per person without extra bed. Each room is offered two complementary drinks, choice of beer or juice. Apartment is almost brand new and we chose a river view room so it was a nice view. Location: not very centre, the area is more like office ppl rather than the tourist like us. Will not choose again for leisure trip next time, will chose if going to Da Nang for a business trip because it is quiet and clean place Check-in: very slow. They claimed that because it was public holidays so they are short on the staff but considering 3PM is a busy time for check-in counter, they cannot assign only 1 person. We had to wait for nearly 30 mins to finally got into our apartment. I was staying here on a “repositioning” overnighter, coming from China and heading to Huế for a 3-day academic conference. Hard to find anything not to love about Zen Diamond: I swam in the pool twice, once with many kids but even then the pool was wide enough for laps; the staff were wonderful, chatting me up and suggesting 2 great small spots for pho and noodles; room very very comfortable; breakfast a wide spread. Quite lovely, I’ll be back. The location is good. The facility is clean. However, the Reception staff is not professional or knowledgeable about how the credit card process works. I was asked to make a deposit twice. Now I have to wait until the final payment shows on my credit card and hope the charge is correct. Room is spacious and comfort. Good cleanliness but maintenance need to improve. The room door cannot be double locked, the toilet board was cracked & the hotel put on two red sticker on the defect place to alert their guest, indeed, I couldn't use that defected toilet board as it is not safe at all. The frontdesk staffs are not pleasant, work like a robot and no hotel info provided. They won't even give a stare when we back to the hotel and pass by the frontdesk, seems so busy. (except the bell staff they are quite helpful and with good smile). The location is a bit far away from the tourist spot. I will not consider to stay here again. 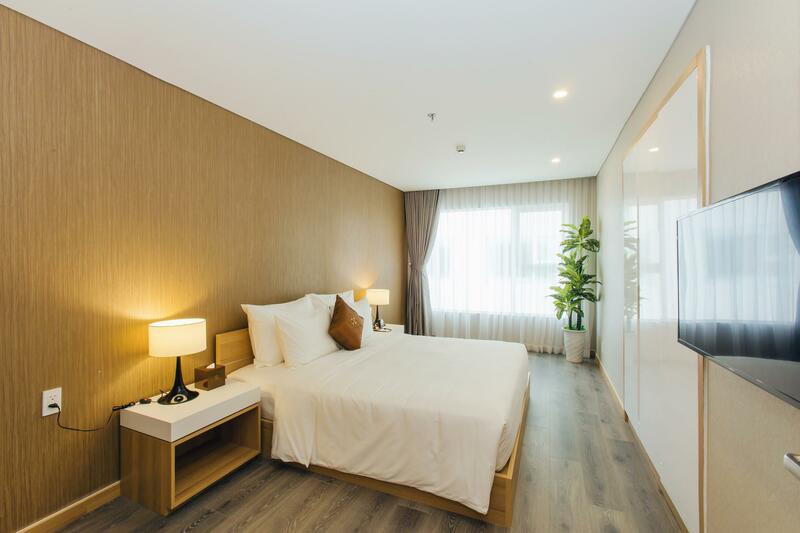 Love this 2 rooms spacious hotel apartment with modern and convenient location. Super fast WiFi would be an add bonus.Grab and taxi usually waited outside this hotel.Will definitely recommend to my friends. I stayed in the two room suite as I was travelling with my parents for the weekend. It is conveniently located with a plenty of spas and stores near by. It’s also 15min walking distance from the famous Han market which you can also get to by a taxi at a pretty cheap fare. The breakfast had great options from continental to Asian food and the staffs were super friendly. The suites were clean and had a great view over the Han River. If you are travelling in a large group, this would be a great place to stay. There is a decent sized living room for everyone to gather around for a drinks and chats at night. I was very pleasantly surprised by the room. Very nice and good for family even. Everything working and the bathroom, 5 stars. 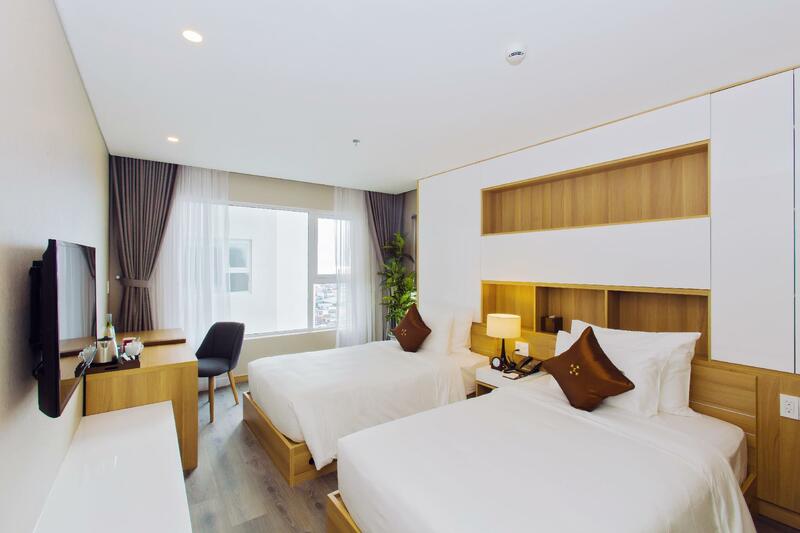 A good choice at the northern end of Da Nang city, this hotel has new and very spacious rooms. Staff are very friendly. Plenty of nice restaurants and bars in the vicinity. Downside is a swimming pool that despite year-round hot weather is indoor, and a very inflexible check-in policy. I arrived in the morning and staff didn't even want to check if there was a room available earlier and insisted that check in time is 2pm. Hotel is about a year old and is furnished with modern looking furniture. Our room was large with two toilets, shower and bathtub. Bathroom was good, clean and large in size but could bebefit with two sinks instead of one. Bed was not the most comfortable but room was large and provided a nice view of the water. At night there's a lot of lights across the Da Nang skyline. Further, there is a balcony which one can enjoy the view as well, though best sit here in the evening when it is cooler. Kitchen has a mini fridge which looks out of place, and no pots or pans. There is a surcharge of 100K Dong for the pots and pans. This is strange considering the price paid for the suite already. There are better alternatives in Da Nang for value. Hotel is quite far from shopping. There are a few coffee joints nearby but nothing fantastic. A quiet street which can be good if you need to recharge for a day or two. Food is decent and available 6-10:30am. Extra 30 mins on most hotels. Grand & brand new property, great location and that were it! Never went for a deluxe studio if you did want to stay away from a large window facing the other apartments’ balcony with all strange eyes looking at you night or day as well as a variety of disturbing noises that anyone next door might make. Then, the ever annoying AC, it suddenly broken at midnight. The staff came up & down to check as well as confirmed it would work well soon, for 3 times. I patiently waited til 1.30AM and thought i should move to somewhere else. Outrageous, it’s summer in Vietnam for God’s sake. They didnot even show any sympathy at all. I sincerely didnot expect a room move, a fan or so would ultimately do for me already. Last but not least, the weird bathroom floor. Water from showering, instead of going all down to the drain, they all came up to the door and stayed there forever to cause such a horrified smell. Staff were super slow, rude and seemed to be not well-trained. Never come back again! everything was great accept water leaked in the bathtub.. Overall, I was satisfied with the 2 nights stay. Toilet seat was a little bit dirty when we first got into the room but other than that, everything else was good. Suite is very good for even a couple. Very spacious and feel like home. But kind of sewage smell is a small stain of this hotel. 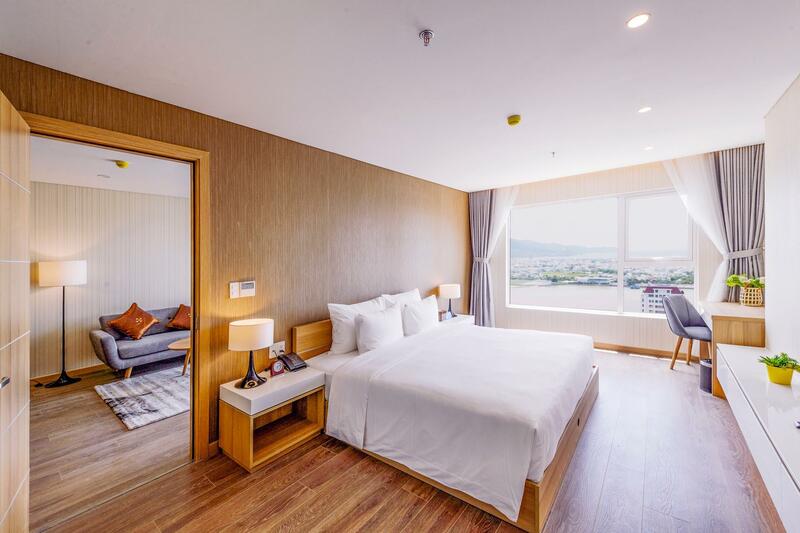 But if I visit Danang again, I will definitely choose this hotel again. Das Hotel hat ein sehr gutes Preis - Leistung Verhältnis. Das Zimmer war sehr modern eingerichtet und sauber. Das Hotelpersonal ist sehr gut geschult, freundlich und aufmerksam. Das Frühstücks Buffett ist sehr reichhaltig und es gibt keine leeren Teller bzw. Getränke.